A Google Earth image of a fishing weir along the Persian Gulf coast. This article was both very good and, well, frustratingly mum on how wildly inaccurate its predictions could well be. Sure, it’s not an official article, but rather a short communication…but I would have thought there would be some tighter screening. So let’s start with what was good: proof of concept. We surveyed the coast of all Gulf countries (inward of the Strait of Hormuz) three times and marked each weir with the Google marker tool…and solved for the total (seen and unseen) weirs…We then raised the total number of weirs corrected for poor resolution by the percentages of missing imagery. To estimate total annual catch, we combined the number of estimated weirs with daily catch rates and ﬁshing season lengths (and the conﬁdence intervals associated with all these parameters) in a Monte Carlo procedure (Uhler, 1980) for each country and for the entire region. What this article gets wrong is how little it discusses its catch estimation methods, and how it established confidence intervals around the estimates that resulted. The mean catch rates used to calculate total catch were 62.2 kg d-1 (n=3; s.d.=32.4 kg) for Kuwait (A. Al-Baz, Kuwait Institute for Scientiﬁc Research, pers. comm.) and 42.6 kg kg d-1 for Bahrain (A. H. AlRadhi, Directorate of Fisheries Resources, pers. comm.). Estimates for ﬁshing season lengths and species composition ratios were also obtained from the same sources, as well as for the UAE (S. A. Hartmann, Environmental Agency – Abu Dhabi, pers. comm. ), while regional averages were applied for countries without these data (Iran, Saudi Arabia and Qatar). Frankly, I don’t even know what a lot of this means. Catch estimates from a personal communication, and one estimate was based on the sampling of just three fishing weirs? And these two personal communications formed the basis for estimates for the other three countries that were assessed? I can’t believe at this moment that these numbers approached anything more than a wild guess. I mean…this is the Persian Gulf we’re talking about. I’m going to assume the former and humbly offer my own thoughts here. First, I think we need to be far more open about the data limitations of each analysis. Until we have developed complementary catch, composition, and season length assessment methodologies for data poor fisheries, we just can’t be throwing around so many numbers as come later in the article. I mean, really, was the following not just a slight overstep? Species composition varies between Gulf countries. Kuwait’s catch is dominated by mackerel (Scombridae; 30%), bream (Sparidae; 19%) and morraja (Gerreidae; 15%), while Bahrain’s catch is dominated by rabbitﬁsh (Siganidae; 26%), swimming crab (Portunidae; 26%), and sardines (Clupeidae; 15%). Over 96% of the UAE’s catch is reported as snapper (Lutjanidae). The regional average species composition is dominated by Siganidae (22%), Portunidae (22%) and Clupeidae (13%). Second, why not develop a methodology where you rapidly assess these parameters. For example, field surveys of the fishermen of the fishermen could be conducted. UAVs could be used to evaluate if fishing effort is uniformly distributed across a fishing area (as the article assumed), or if it follows some predictable pattern to take advantage of variable fish distributions. You could also work with a national fisheries agency to get authorization from the fisheries ministry to deploy some experimental traps to estimate these variables. Anyway, food for thought. [O]ur results speak to the potential for satellite imagery and remote sensing to expose illegal ﬁshing practices. In the same way that industrial ﬁsheries rely on technology to target catches (i.e. Fishﬁnders, GPS Chartplotters etc. ), technological advances in satellite imagery can be used to monitor ﬁsheries remotely, particularly in areas that were once considered too remote or expensive to enforce. In the case of Qatar, our methods revealed 17 operating weirs (14 visible directly and 3 added to compensate for poor resolution and imagery availability), despite their ban in 1994 (M.S. Al-Muhindi, Ministry of Fisheries, pers. comm.). 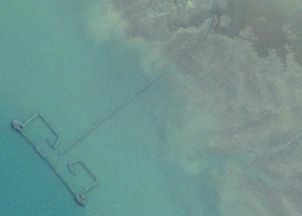 Beyond other large semi-permanent structures, such as ﬁsh ponds in Hawaii and Japan, vywers in South Africa, or sakkar in the UAE, satellite imagery can be used to expose other illegal marine practices, such as verifying the magnitude of oil spills (Amos, 2013), assessing the use of illegal ﬁshing gears, and monitoring activities in Marine Protected Areas (MPAs), among others. This is particularly useful for improving data collection in countries with known data inaccuracies, or in developing countries where resources allocated toward conservation and/or management are scarce.